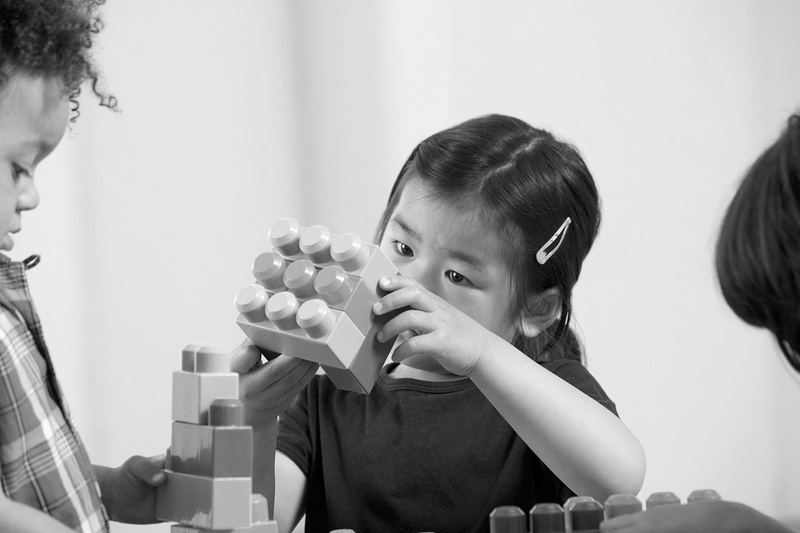 In this post, Jere Confrey, Joseph D. Moore Distinguished University Professor, Science, Technology, Engineering and Mathematics (STEM) Department, College of Education, North Carolina State University, discusses why the Common Core State Standards for Math can be considered developmentally appropriate. A more detailed version of this analysis, including this chart and others, is available here. 1. 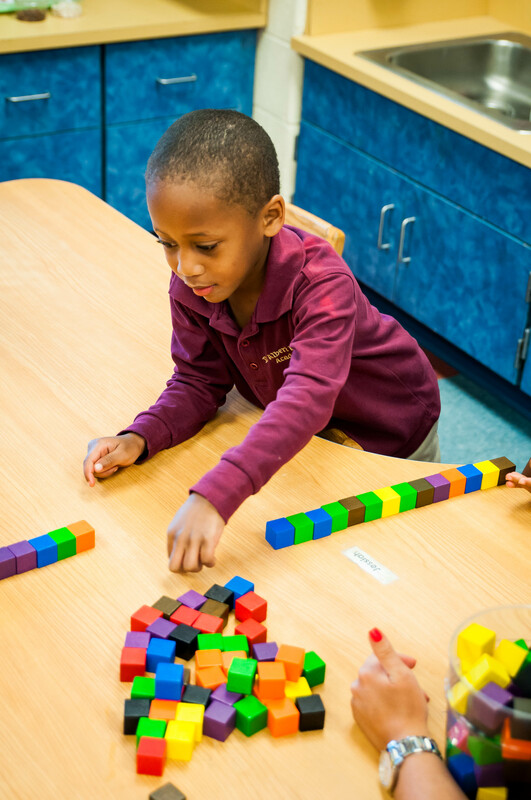 The CCSS-M development process drew on teachers and experts in early childhood math education. According to Jason Zimba, a lead CCSS-M author, feedback was obtained from state directors, elementary teachers, and national experts (Fact Sheet, Student Achievement Partners. The NCR’s 2009 report, Mathematics Learning in Early Childhood: Paths Toward Excellence and Equity was used. The National Association for the Education of Young Children in conjunction with the National Association of Early Childhood Specialists in States issued a joint statement publicly expressing their support for the Standards. 2. Standards are not meant to be read to children. They represent professional knowledge in the field for teachers–just as in the case of medical knowledge, the Standards are not expected to be communicated verbatim to patients by doctors. 3. Standards typically state a clear target in the first sentence that describes the expectation, followed by research-based strategies for student success. After that, the Standards include suggestions for research-backed strategies for learning, to ensure that the students’ learning is made as conceptually rich and efficient as possible. Math is a language of connections. Here is first grade example: “Add and subtract within 20, demonstrating fluency for addition and subtraction within 10. Use strategies such as counting on; making ten (e.g., 8+6 = 8+2+4 = 10+4 = 14); decomposing a number leading to a ten (e.g., 13-4 = 13-3-1 = 9)…and creating equivalent but easier or known sums (e.g., adding 6+7 by creating the known equivalent 6+6+1 = 12+1 = 13).” These strategies, from the NRC’s Adding It Up, are a toolbox for a teacher to build on children’s ideas to reach towards the development eventually applying standard algorithms. 4. The Standards are consistent with international standards. 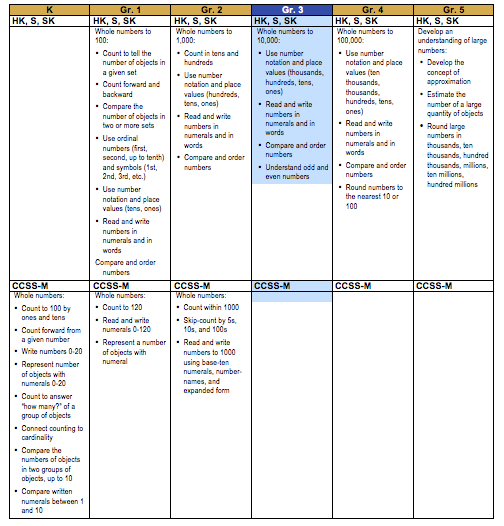 In Informing Grades 1-6 Mathematics Standards Development, AIR took the standards from Singapore, Korea, and Hong Kong, and created a composite set. The major topics in the numbers strand for all three countries follow a similar pattern, across grades, dictated by the logic of mathematics learning. In the chart below on understanding and reading whole numbers, CCSS-M is compared to this composite chart. If we claim our standards are not developmentally appropriate, then how is it that other countries achieve these outcomes? Note, these countries do not offer Kindergarten.